Welcome to the Mid-Week Blues-Buster Flash Fiction Challenge, Year 2, Week 26– the Halloween Edition. It’s Halloween week, so this week’s song prompt is a creepy tune by The Pogues. The song is, “The Turkish Song of the Damned”. This week’s Judge is…. me. Note– this is the last MWBB until after NaNoWriMo is over at the end of November. It may stay gone for a while after, considering the thunderous round of indifference this challenge seems to generate each week. We’ll see. The challenge opens the moment you read this post and runs through MIDNIGHT PACIFIC TIME on Friday October 31st. And so endeth Week 2.25 of the Mid-Week Blues-Buster. We got one more entry than we had last week, which is cause for celebration. I’m hoping for a good turnout for next week’s Halloween MWBB. We’ll be closing up shop for the month of November, as many of the writers associated with the MWBB, myself included, will be participating in National Novel Writing Month. But before we get to next week we have to close the books on this week. Judge Josie Beaudoin had good stuff to read. She chose one winner and one honorable mention as we had so few entries. Well first off, I need to say that I was pleased how diverse the stories were. There didn’t seem to be a single one that sounded like any other one to me. I love that fact. Everyone took something quite different away from the song prompt, yay! So we got five entries, which means Todd has asked me to give him one Winner and one Honourable Mention. Which is a good thing, because there were two stories that really stood out above the others, and I wasn’t looking forward to not giving a prize to one of them! Let me get the awards out of the way, then I’ll examine each story individually for a little feedback for each of the writers. Honourable Mention has to go to Miranda Kate for her piece, Addiction Demons. Let me tell you, Miranda, that wasn’t easy to decide. This piece is really good, and it was a fine line between the two “winners” in this contest. I’m glad I was able to give an HM to someone, because this is a really solid piece, and I’d love to see it expanded upon. It feels like the beginning of an episode of Supernatural or Dr. Who, and could really go places if you used it as a seed. It also stands alone nicely. First Place this week goes to Ruth Long, who wrote Origins. This really gave me the shivers. I just adored it so much. Of course, how could you know that this week’s judge just happens to be a fan of serial killers and the inner workings of their brains? Luck of the draw, I guess. Also the fact that you had very few typos made the reading easy and enjoyable. I can be a bit of a Grammar Nazi, and those things really throw me out of the story and into editor mode real fast, which is very distracting. I only found four technical errors in this, so it read pretty well. The quality of the story was able to overcome those errors easily, which tells you how good it was. Like Alan, I too appreciate the surrealism of this piece. I really do. I enjoyed reading it. But sometimes too much is too much. Surrealism needs to tie in to something for me. If this were a longer piece, it would have the opportunity to do just that, but being flash fiction, it doesn’t. It goes out on a limb and just sits there. It doesn’t fall down, but it doesn’t spread its wings and fly either. It’s fun, but it doesn’t accomplish anything. I liked it, and would love to see it go somewhere. I’ve always liked opening a story in media res. It’s a style that appeals to me. Unfortunately you don’t fill in the back story to make it clear how we got there. In 866 words, which is far above the 700 word limit, you actually apologize for being overly wordy (“Even my thoughts can be quite wordy at times.”), but you don’t actually provide a whole lot of information, just lots of description. It’s good description, but it doesn’t further the story much. In flash fiction, furthering the story is absolutely vital. Just Enough Isn’t Enough, by Jennie C.
Okay, I didn’t feel the explicit content warning was really necessary. There was just nothing explicit in this piece. I mean, I braced myself, but it was very vanilla. No dirty words, no detailed descriptions. An X-rated situation, yes, but no X-rated details. Additionally, as the owner of a home that receives Section-8, you might be interested to know that slums are not allowed. If your building is not up to their standards, it’s not given S-8 status. I had to replace windows and add an extra fire alarm before my building was good enough for Section-8. I mean sure, it adds flavour to your piece, throwing around “poverty buzzwords” like slums or S-8, and I get that, but it’s inaccurate flavour. Thanks to all of our writers & readers, and thanks to Judge Josie Beaudoin for the tough love. She threw a quick, stiff left jab– quicker and stiffer than the Phone Booth’s effort. I hustled to evade the punch, diving far enough in to feel the heat coming off her body. “Why so close to the attacker?” she asked. I caught a whiff of the blood orange she’d eaten after her morning workout. Her right fist grazed my ear on its way through. Welcome to the Mid-Week Blues-Buster Flash Fiction Challenge, Year 2, Week 25. We’re heading toward Halloween, so it seem appropriate to turn up the creep factor with this week’s song prompt. The tune is, “Still Life”, by Iron Maiden. We’ve got another first-time Judge with us this week… Everyone, meet Judge Josie Beaudoin! The challenge opens the moment you read this post and runs through MIDNIGHT PACIFIC TIME on Friday October 24th. Light turnout for the MWBB this week, but Judge Eric Martell showed up anyway & got the job done. Four stories this week, each one so different from the others it was hard to see how they could have all come from the same song. Muses sure come in all kinds! “Talkin’ Blues: A Tribute” – Josh Bertetta: Josh decided to play up the blues aspect of the song by appropriating lines from more blues songs than I could count. (The teacher in me suppressed the request for a citations page.) A well-woven tale integrating that many sources is an accomplishment. I did notice a couple of homophone mistakes that pulled me out of the story. Untitled – Jessica Maybury: I really liked the feel of this one, and I wanted to know more about the narrator and his emigration from LA to Rush. I also wanted to know more about his night with Ruby. With almost 250 words left to work with, it felt like the start of something, but incomplete, even for flash. “Geis” – Josie Beaudoin: A fascinating story about a man cursed for what he’d done to one woman to live, if not quite forever, a very long time. And then he runs into the possible answer to what would have to be the hope of anyone stuck living so long. Minor editing point: I think the last line would have held more power without the ellipses at the end. “My Name Is Rosaline Evangeline Ophelia Carter” – Mona Bliss: I felt like I knew a lot about the town Ms Carter grew up in, and it wasn’t hard to feel for a forlorn woman who blamed herself – and came to punish herself – for an unfortunate string of picking the wrong men. Nice job of worldbuilding. Because there were only four stories this week, I’m just going to pick one winner. I enjoyed reading them all, though, and thanks for writing them. Winner: “My Name Is Rosaline Evangeline Ophelia Carter” – Mona Bliss. Thanks to all of our readers and writers, and thanks to Judge Eric Martell. I hope to see a few more of you next week…. This week’s snippet moves us ahead in the story some. We get to meet Satsuke, the woman responsible for Meyer’s martial arts training. The action picks up the day after Meyer’s run-in the Phone Booth and Rebar Guy. The gentle, yet inelegant brush of Satsuke’s bare feet on the hardwood floor of her studio stirred me from meditation. She walked slowly along the far wall, straightening the pads and gloves and headgear on their pegs, pivoted to the middle of the room to linger, catlike, in the sunlight admitted through the three large windows on the outside wall, before coming to me. I awaited her approach with my eyes closed, following her movements from memory. I pictured her, long hair up in a tight bun, dressed in the old Joan Jett t-shirt and men’s gym shorts she always wore to the studio. She stopped in front of me, waiting. I breathed in the familiar scent of her morning workout– equal parts jasmine sweat and pain– then opened my eyes. “You ran into something last night,” she said, searching my face with her deep green eyes. She stared me down for another few seconds, then assumed a fighting stance. 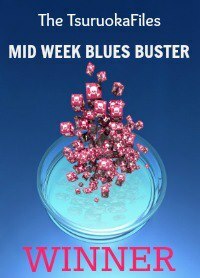 Welcome to the Mid-Week Blues-Buster Flash Fiction Challenge, Year 2, Week 24. This week’s song prompt is a little taste of the blues, courtesy of one Levon Helm. The tune is, “False Hearted Lover Blues”. This week’s Judge is MWBB veteran Eric Martell. The challenge opens the moment you read this post and runs through MIDNIGHT PACIFIC TIME on Friday October 17th. And thus ends Week 2.23 of the Mid-Week Blues-Buster. Judge Jessica Marcarelli had some great stories to sort through. Thanks so much for letting me judge this – it was so much fun. Everyone is very talented. I enjoyed myself. drmagoo – I love this story. The cabin imagery for his hidden self is beautiful. It clicks just the right way. Unfortunately, even after several digital and physical counts, it was just over the slushy 700 limit. It still gets an honorable mention, however, for the lasting impression it made. The Red Dress by Denise Callaway – I thought this was another vampiric story but you surprised me. A good intrepretation of the siren idea, especially considering the song that inspired it. I could almost hear the music pounding in the background as she came for him. Orson Holloway’s Reunion by CharlesWShort – you are the only one who turned this into science fiction and I love that. The hopelessness is well done and you’ve got a believable universe going on here even with only 640 words. Well done. Splintered by bullishink – I don’t like the whole Twilight/vampire love story thing. But this. This is horribly good. Love, but twisted, showing the darkness and helplessness of a relationship with such a creature. It’s a wonderfully dark twist on the song. The Cabin by PurpleQueenNL – Wow. What a sucker punch ending. I didn’t see it coming and that is an accomplishment. Not only that, but the song fits this macabre story so well – or vice versa? Either way, it’s a visceral, well-written piece. Home… by LastKrystallos – Your story has stayed with me since I read it…and I keep going back to re-read it. I can feel her anguish, feel his twisted desires, and it makes for such a delicious read. To come to the end and discover the truth – one that you hid well but seemed oh-so-right when we got there – was saddeningly satisfying. It’s a dark and haunting fulfillment of the song that inspired it. Congratulations on a job very well done! Thanks to all of our readers & writers, and thanks to Judge Jessica Marcarelli. I felt the wind on my face at about the same time I noticed Danny hustling my way. His good hand hovered near his hip. I dropped into a clumsy crouch as a foot and a half of rebar sliced through the space where my head had been. The swing and a miss sent Rebar Guy– a wiry army fatigue-wearing guy with a shaved head and a prominent chin– stumbling toward Danny. I snapped off a low back kick before Rebar Guy regained his footing. He howled as the ligaments in his right knee came apart. I jumped on his back, forcing him down on his injured knee. He howled some more and took blind, backwards swats at me with the rebar. I threw my arm over his shoulder and around his neck, positioned my bicep against his throat, then squeezed. He let go of the rebar. The clang of metal on sidewalk got lost in the cold silence of combat. I braced my other forearm against the back his neck, increasing the pressure on his carotid arteries. One last, desperate elbow found the mark, catching me low on the left side of my ribcage. I let my breath out through my teeth and tightened the choke hold. Rebar Guy flailed for another few seconds, then went slack in my arms. I let him fall, watching his chest for signs of respiration. Welcome to the Mid-Week Blues-Buster Flash Fiction Challenge, Year 2, Week 23. This week’s song prompt is a great tune by Cory Chisel and the Wandering Sons. We’ve got a first-time Judge reading for us this week. Say hello to Jessica Marcarelli, everyone! The challenge opens the moment you read this post and runs through MIDNIGHT PACIFIC TIME on Friday October 10th.